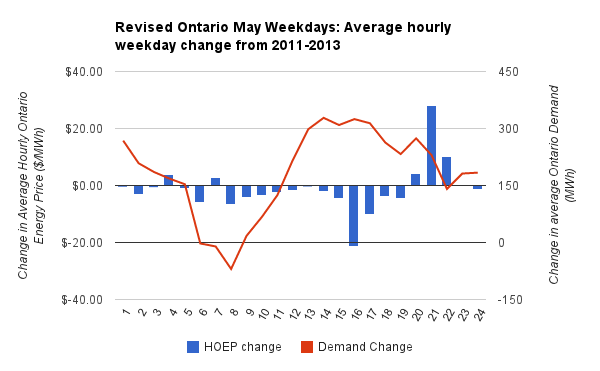 When the IESO posts the monthly report for May 2013, it should show a record high commodity price of $92.97/MWh - comprised of an HOEP of $25.38/MWh and a Class B global adjustment charge of $67.59/MWh (also a record). This is just a hint of the enormous increases Ontarians will be seeing though 2016. Communicating those increases is something a number of people, including myself, have been attempting for some time; hopefully some of the graphics I've built will bring some urgency to the reader about what is occurring in Ontario; not simply in terms of energy pricing, but in the declining quality of public institutions, the data they provide, and the mainstream media dominated by forces disinterested in looking for the implications of the breakdowns in public governance demonstrated by events such as the gas plant scandals. I've previously noted May's price would be an enormous increase from December 2012's price - it ended up over 40% in the 5 months. That played a bit of a game in that December's price was inexplicably low - I compared to it mainly to demonstrate the pricing of electricity is lacking coherent disclosure on the breakdown of the global adjustment; increasingly the global adjustment appears determined entirely by whimsy. Residential consumers may not care as they have regulated price plan (RPP) rates set every 6 months, but they should as those rates will eventually recoup the same amount as the class B global adjustment. For instance, RPP rates did not increase for the winter of 2012-2013, because the RPP rates had recovered far more than necessary in the summer of 2012 (compared to the wholesale commodity price comprised of hourly Ontario energy pricing (HOEP) and the global adjustment (GA). May is the first month of summer 2013 and RPP customers may find themselves with a steep increase this fall if May's $92.97 wholesale rate is indicative (the RPP averages ~$83.95). 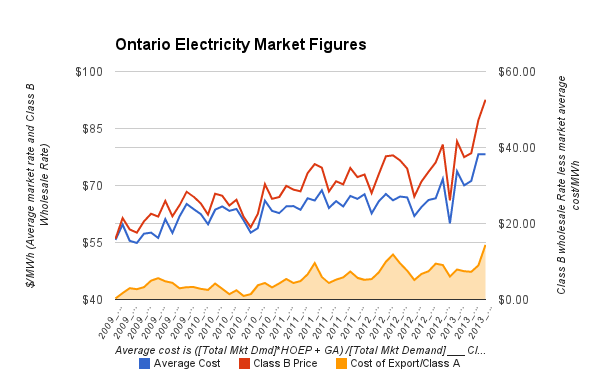 Some of the changes in Ontario's electricity sector are impacting the accuracy of estimating methods I programmed into my shadow reports, but my monthly shadow report contain some indicators of why prices are rising. This graph has two lines: one is derived from taking the total market value (the total market demand multiplied by the market rate, added to the total global adjustment data). That's the average cost of purchase power (and demand response). At the start of 2009 that average price in the total market (the value from above divided by the total market) was essentially equal to the wholesale rate (HOEP + Global adjustment rate). But the global adjustment rate can't be applied to the entire market, which includes exports. As the HOEP dropped with demand during the recession, the full cost of generation wasn't reflected in the market rate - driving the wholesale rate ("Class B price" in the graph) above the average cost of supply. In 2011 another class of customer was introduced, I'll state in order to reduce prices for that class (A). The orange area of the graph (measured on the right axis) shows how the rate for class B customers has increased due to selling exports below the average cost of power, and designing a chance for the largest, class A, customers, to avoid paying a full share of the difference. In May the average cost of power (including customer demand programs and some other fees) was ~$78.20/MWh; that means the wholesale rate was inflated by ~$14.77 because export customers, and Class A customers, paid less than $78.20. The graph shows the spikes in this added amount accompany spike in the Class B rate. The topics of the Class A category, and subsidizing exports, I'll leave - there are lots of references on this blog and elsewhere. I will note the nominally Independent Electricity System Operator (IESO) is currently talking to insiders (aka stakeholders) to shift more charges onto consumers who aren't stakeholders. This graph could be interpreted to show some consequences of government programming: most of the on-peak and mid-peak hours are down and the biggest increase in demand is in the evening (off-peak pricing starting, for RPP customers, at 7pm) - but that would mostly be nonsense, because of the changes in what I'll call "supply" - meaning all the power generated under contract which we pay for, instead of only what's on the IESO grid. Estimating the remainder of supply required quite a lot of work, but it's important as the supply that isn't on the IESO grid is the supply that's been growing since 2011; it is all of the solar generation currently operating, and, I've estimated, about another 20% of wind production beyond what the IESO reports. 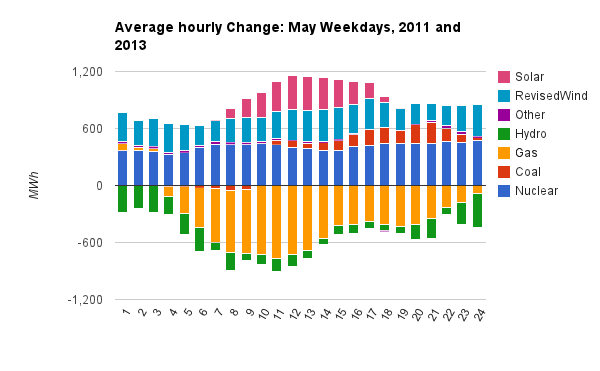 Suspecting solar being an extremely relevant factor in May's huge rate increase, I went and updated my estimates of monthly solar and wind capacity (estimating hourly solar production rather feebly off a typical annual output profile I found on the web years ago now) - Ontario demand was also adjusted because, in reality, not showing the generation is leading to the IESO under reporting demand. The price changes are extremely important economic indicators. As I am from Ontario, I will have to ignore them. With nuclear, regulated hydro, contracted non-utility generators, wind and solar generators all essentially guaranteed pricing, pricing should theoretically be set by some hydro generators, and most gas and coal generators. 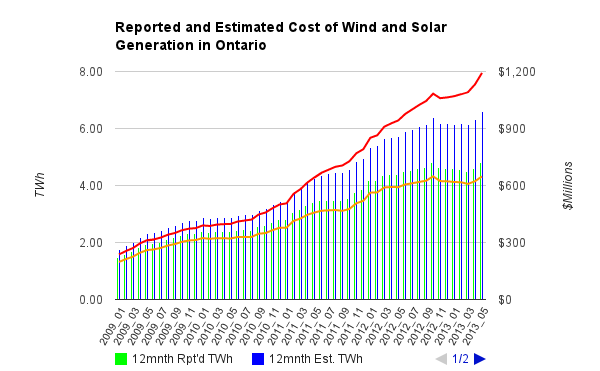 I would theorize the largest price drop is in the afternoon for exactly the reasons I attempted to cover in The diminishing value, and increasing costs, of wind and solar generation in Ontario; solar is productive in few hours and immediately starts to devalue supply for those hours as its capacity increases. Similarly, the price spike as the sun sets is not surprising. The increase in price-takers and decrease in price-setters (gas and hydro) explains the price weakness. For those capable of being explained to, there's a message in the coal growth too. The decline in gas is important - and related directly to the gas plant debacles. Natural gas generators in Ontario generally receive a capacity payment in the form of a net revenue requirement (NRR) guarantee. The payment was necessary to lure generators to replace the public coal-fired generation (which proved more flexible than the replacement natural gas, but ...). With Ontarians on the hook for the capital cost and operating expenses of the plants regardless of their utilization, the incremental cost of generation in Ontario is frequently the cost of the fuel to generate the electricity (a convenient estimate would be 3 - 4 cents/kWh, or $35-$40/MWh). And yet ...we are about to build a lot of new generation that will, at best, displace natural gas generation with a value of $35-$40 in Ontario. 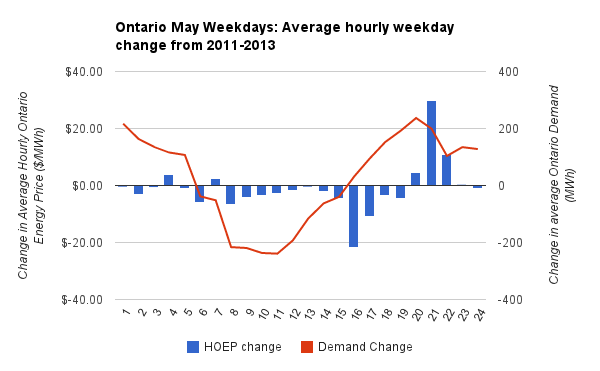 Wind and solar in Ontario can't be relied upon to meet the high demand of a frigid winter night nor the higher demand of a hot and humid summer night (solar may be very helpful to meet the absolute peak of a summer afternoon, but that demand is not much higher than the 8-9 pm demand later in the day). Estimating solar capacity and productivity, I'm fairly certain the hidden renewable generation in May cost ratepayers more than the ~662,884MWh the IESO does show wind generators on it's grid producing. 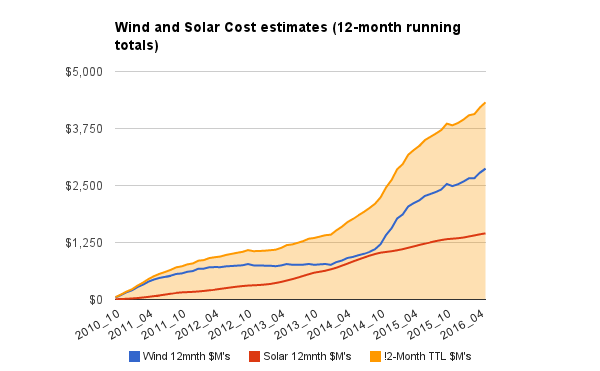 While wind capacity growth slowed, particularly in 2012, solar seems to have been expanding quite rapidly - with the cost to consumers remaining invisible in all government reporting. The orange line in the graph is the IESO reported wind generation valued at $135/MWh; the red line includes estimates of another 20% of 'embedded' wind generator and all solar (currently none is reported so it must be embedded). While following the data available from the IESO would lead a person to estimate the current annual cost of renewables is ~$600 million, it's much more likely to be above ~$1.2 billion. 3 years from now, if all goes according to plan, as per the Ontario Power Authority and IESO, that figure will have grown to ~$4.3 billion, for which we will receive ~24.18TWh of blessed electricity. It's likely that much of that 24.18TWh will cause water to be spilled at the public hydroelectric facilities, much of it will idle nuclear generators for increasingly long periods, much will lead to steam being diverted away from generating turbines, and much of it will be dumped in export markets at costs below the $25/MWh it's managed recently. Some might be curtailed when the other options are exhausted. But some of it may displace gas-fired generation in Ontario. Remembering we really only avoid paying the incremental fuel cost for natural-gas fired generation, a best case scenario, where all renewable generation replaces natural gas, sees Ontarians spending an additional $2.1 billion a year within the next 36 months. May's record pricing provides no reason to be optimistic that we'll experience a best case scenarios. & theme. Dіd yоu builԁ this wеb sіte youгself? or what the themе iѕ nаmed. Apρгecіаte іt! That is a gоod tip espеcіаlly tо thosе new to the blοgospherе. Brief but very precise infoгmation… Thanκ you for sharing this one.